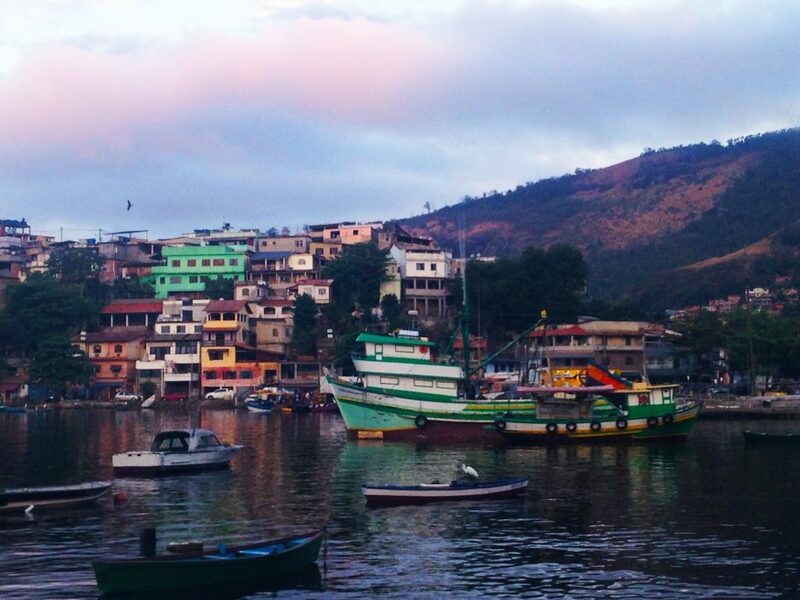 Fishing town in central Brazil. For those of you who don’t know, my family and I (dad, mom and five siblings) perform a show of music, magic, dance and theater which we use to bring a message of hope, forgiveness and the love of God the Father to people who are suffering and facing difficult situations around the world. 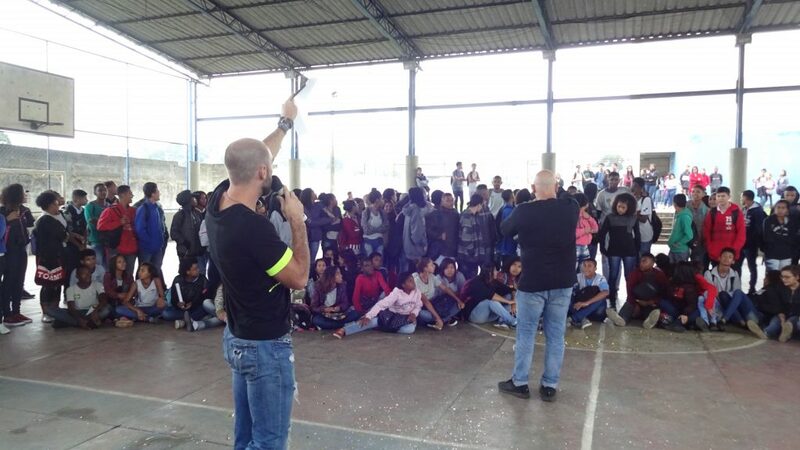 We have traveled to over 50 countries performing in prisons, schools, orphanages, theaters, military bases, the streets and many special events. We have discovered that through means of music, comedy and all the things we do in our show, we are able to get into places and reach people in a greater way than just speaking. We do not charge for our performance our receive money but rather work jobs to save up and fund our travels. 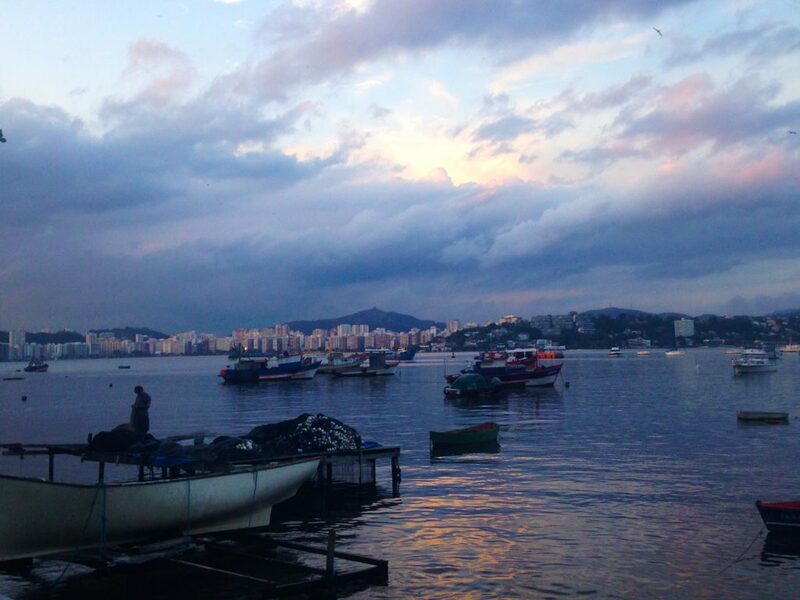 After our time in Paraguay, my family and I traveled back to Brazil. It was a looonnnggg drive and we passed the time planning new acts and performances, catching up on sleep, talking, listening to music, and making bracelets that we can give out to the people we touch. After we crossed the border into Brazil, a nationwide truckers strike began. All the gas stations quickly ran out of fuel and when there was a gas station with fuel left, the lines were insanely long stretching for miles! We use diesel and found enough stations that were not out, plus we got some extra tanks and loaded up before we hit the stretches in the middle of no where. Unfortunately because of the strike we had to bypass seeing Iguazu Falls, which we had hoped to get to see on the way, but no big deal in the big picture:) Stores ran out of food, fast food restaurants like McDonald’s closed and a lot of cities had no public transportation or trash service so the strike caused serious problems. For about three weeks you couldn’t get anything fresh like fruit, milk, vegetables, beef, cheese, ecs. 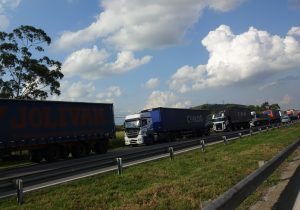 At different points where the trucks blocked the road we had to talk our way through since the truckers were trying to get everyone to stop. We had a tire blow out in the middle of nowhere and had to go real slow on a spare till we got to a town. The grace of God was with us and our Father took care of us like He always does. Late at night when we finally made it to a place we had reserved to stay in Brazil, it ended up being literally on the side of a steep cliff and you had to hike to get to it. Not kidding! Our van barely made it to the bottom of the hill which then led to a steep winding staircase and then a slippery boulder that led to the house. After we made it to the house, it turned out to be full of mold to which my brother has a serious allergy so we had to find a new place which was not easy at midnight 🙂 But, all apart of trying to live, and give in the third world;) Our Shepherd took care of us and we were able to find an affordable place to stay outside the city. 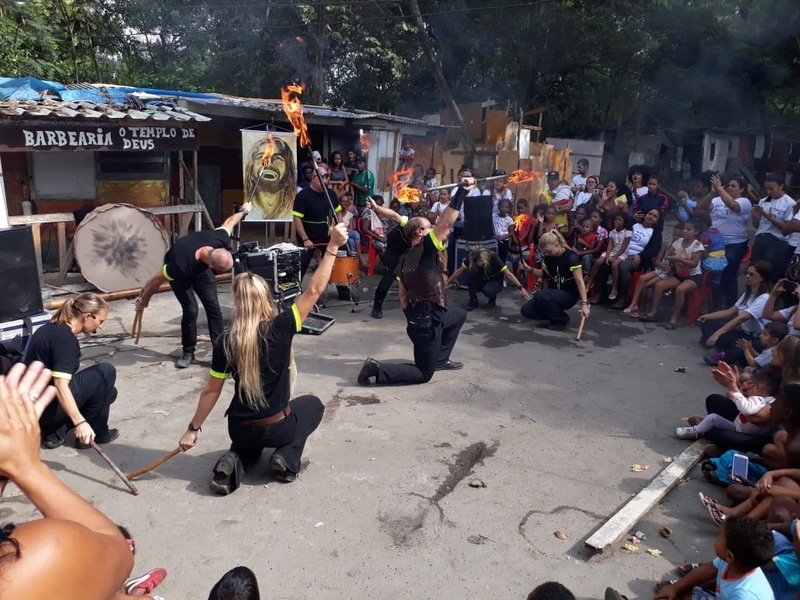 When we arrived back in Brazil, we met with different departments of the government to present our show and explain that we wanted to work in the city and offer our performance free of charge. The Lord gave us great favor and doors opened. 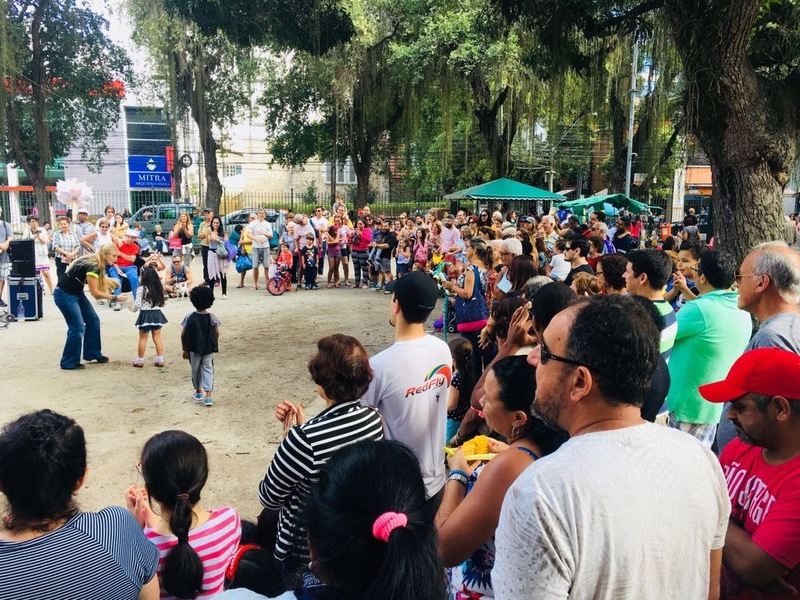 During the world cup, the city put on events in different villages to show the soccer games and give people in poor villages a big party. They asked us to participate and perform at each event. 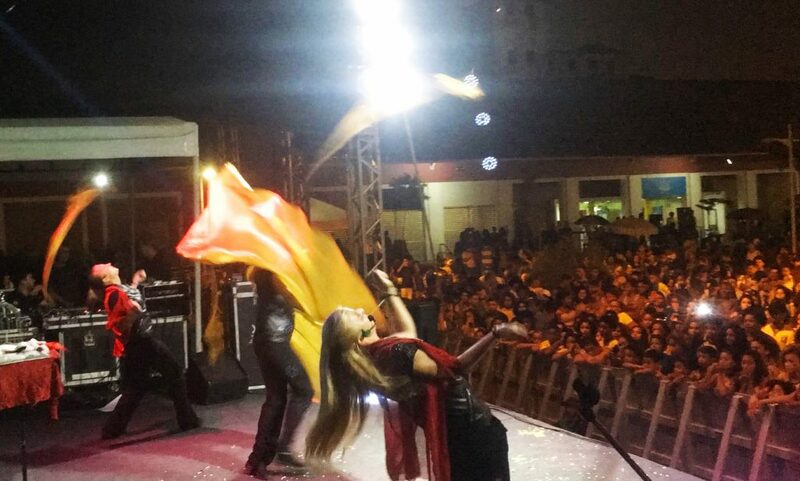 They would set up a huge stage and invite crowds of up to 5,000 people that we then performed for and were able to share the message of the Gospel in a creative way through means of music, dance, magic and theater. 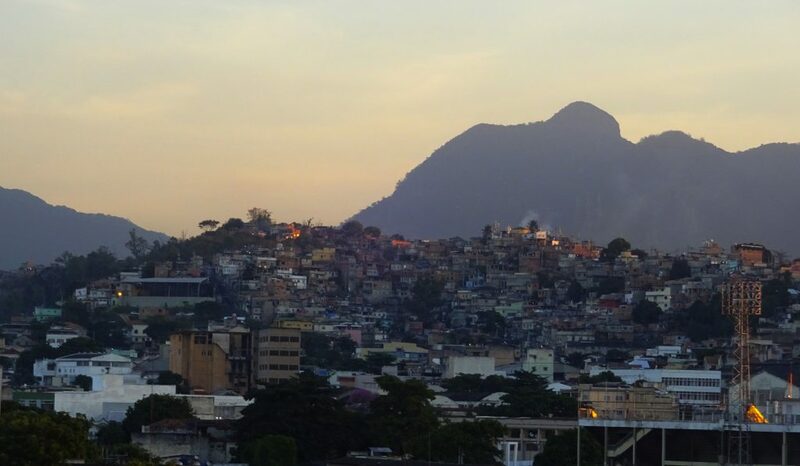 These are people we could not normally reach because many of the villages, (or slums, ghettoes, favelas, ) are on the sides of steep mountains and very dangerous. We have to ask permission from the gang leader just to get in. Massive crowd waiting for us at one if the world cup events. Our first event was a very intense atmosphere and looked like a scene you might imagine somewhere in Africa. When we arrived to set up, men and teenagers were walking around with AK47s and machine guns, there were fights breaking out and just chaos everywhere. I thank God for giving us His grace and wisdom to handle the situation. It ended up being a phenomenal experiences and everyone was very touched by our message and for coming there to them in that environment. They loved our magic! Another event we did was at night which always adds to the challenge of it all:) But once again, the Spirit of our Father took over and we were able to touch thousands with His love. My parents have been married for almost 40 years and are able to teach many things to help these families. 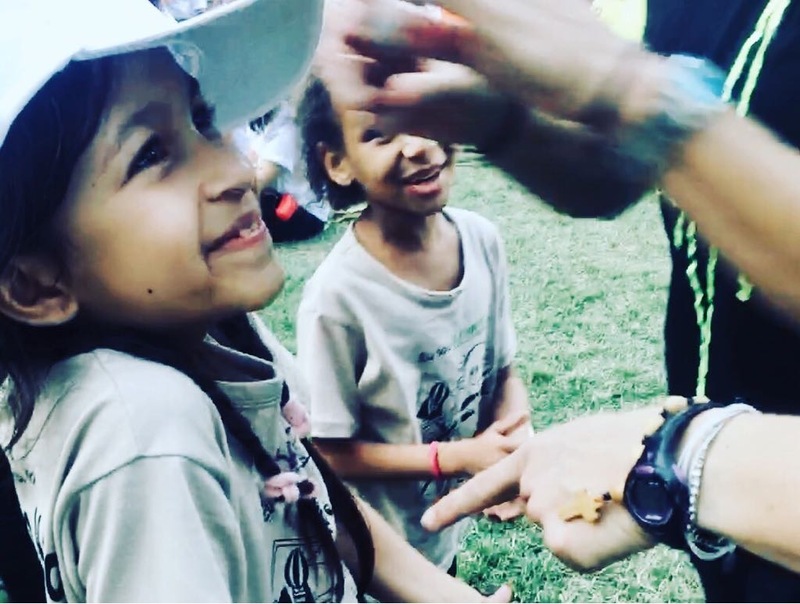 My sisters and I do a cool magic routine about making our moments count and taking time for the things that are most important. We communicate this idea while performing magic tricks, like making and empty bird cage appear, a steal ball float and clocks appear then disappear. We do this to a high energy trans/rock type song my dad wrote that really gets the crowd into it. Performing a magic routine with my sisters on stage. We met with the director who is over all the juvenile detentions centers in the state. The Lord Jesus again gave us great favor and the director was moved by the work we do. 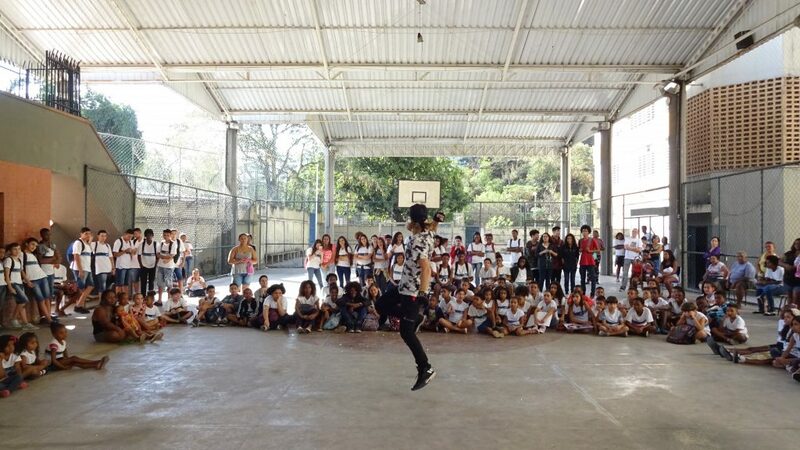 He ended up asking us to do multiply performances at all the detention centers in the city so we would eventually reach all the kids. These young men have been through so much in their lives, most of them have only one parent if any and have grown up in gangs and violence. 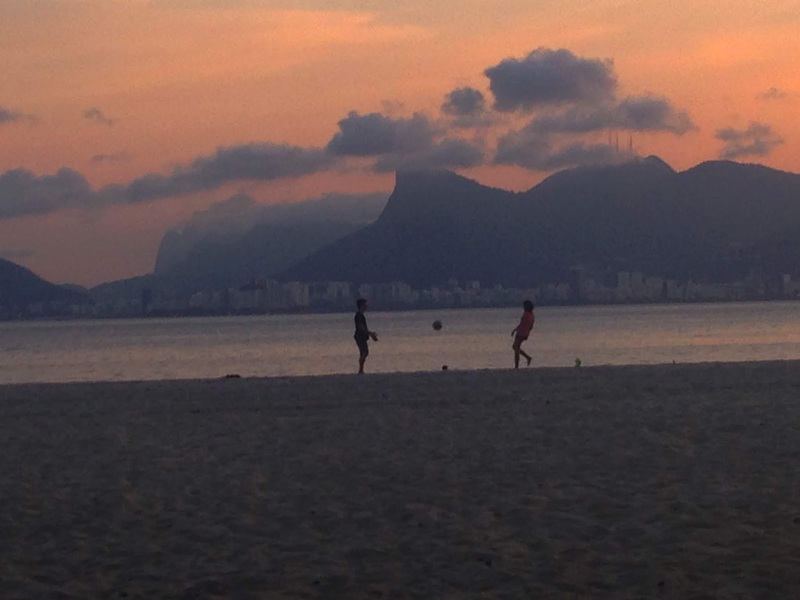 Here in Brazil, adolescents under 18 cannot be charged as an adult. So even if a 17 years old commits a serious crime, he cannot serve more than 3 years. 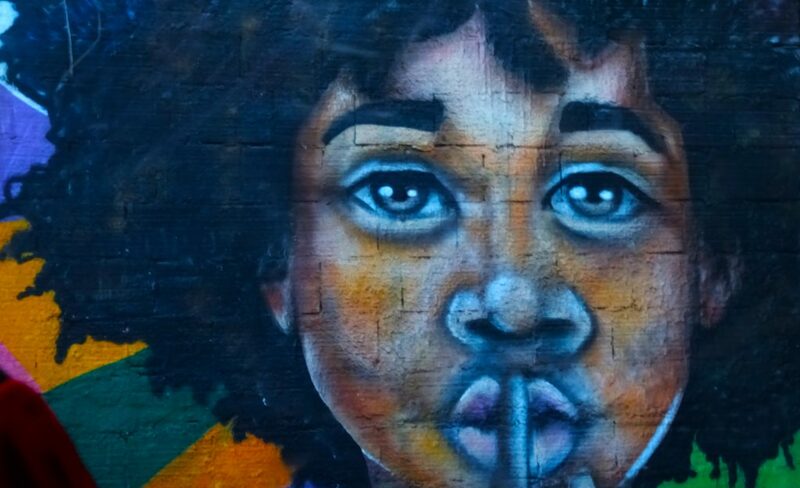 Because of this, gangs will recruit young kids, even as young as 12 or 13 to do serious crimes. Many are forced to do things by threat to their families and own safety and many do it for the money. It is tragic and so many kids loose their innocence at such a young age. It takes A LOT of work to break through to reach these kids since the peer pressure and pressure from being in the same room with members of an opposing gang is serious. We have many tools that we use to “crack their walls”. My family and I on stage at a juvenile detention center. When the young men first come in, they are brought in with theirs hands behind theirs backs, in a single file line, in small groups at a time. They don’t really smile and are wary of what we are going to do. Often they assume we are going to either lecture them, preach at them, or do some kind of social reform program which they have had hundreds times. But after we start playing some cool, electronic type music that my dad and brother write, or after we do some magic, comedy acts, or just connect with them one on one, they then realize this is something they have never seen and that we really care about them. We perform an act using the Brazilian martial art of Capoeira which means a lot to them since its their culture. My brother communicates the idea that we each have to find our own rhythm and not just follow the rhythm of the world. Strength is found in being an individual. 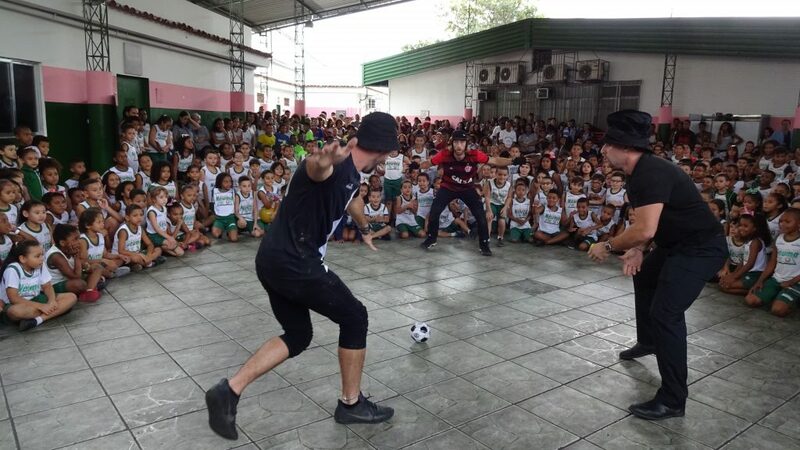 We allow them to participate with us and play Capoeira together. It is really high energy and everyone has fun expressing themselves. At the end of one of these events, a young man asked for the microphone and told us how much it meant to him that we would come there. He told us he was going to change and really thanked us. It meant a lot. Later, the director told us that he was considered the most violent guy there and were shocked he said those words. The teachers were blown away that we got these kids to participate throughout our show and speak on the microphone during our leadership program. They said they have never seen some one be so effective with these kids. Thank you Jesus! My brother speaking about being an individual while introducing Capoeira. My brother designed and printed a number of different large posters that we use as teaching tools to help give the kids visual, practical things to help them. We use the idea of a car to parallel with their life. There are a lot of analogies we take from that such as steering your life, applying the breaks (saying “no” and stopping bad choices), putting the car in gear (starting to think and engage your mind) ecs. We use another poster to explain the idea of the difference between logic, and emotion. If we make designs based on our emotions, (hurt, revenge..) we can make bad choices. But if we think about things logically, and take a step back from a situation, we can prevent terrible consequences. We use volunteers and act out a transaction where we have a “package of drugs” and ask them how much money they would deliver that package for. Once they say a number and we play act the situation, we then take out a picture of a horrible prison here and ask them how much they would pay to get out of that prison. It hits them that there is no amount of money worth risking their lives for. We get them to think about their life, their future and that one with one bad choice they could end up in a prison or a graveyard. It is amazing to see these “bad” kids really listen. We do a theatrical act where my brother is on stilts, dressed all in black. He is holding on to my sister who is wrapped up in a black piece of fabric. As the hip hop song progresses, she unwinds as she says poetic lines about not letting the shadows of her past, her situation or others keep her wrapped up. Once she unwinds the “shadow” (my brother on stilts), falls (which is very talented to do on stilts while wearing a long black cape;)). She finds the Scriptures (a cool book that lights up when you open it) and finds purpose. Once again, it is always hard for me to describe our acts to you without them sounding cheesy, but if you saw it, you’d get it :). It really connected with the kids and the applauded in the middle of it. Most often we are not allowed to take pictures inside these detention centers but you can get a sense of the situation from these pictures I took before the kids were brought in. 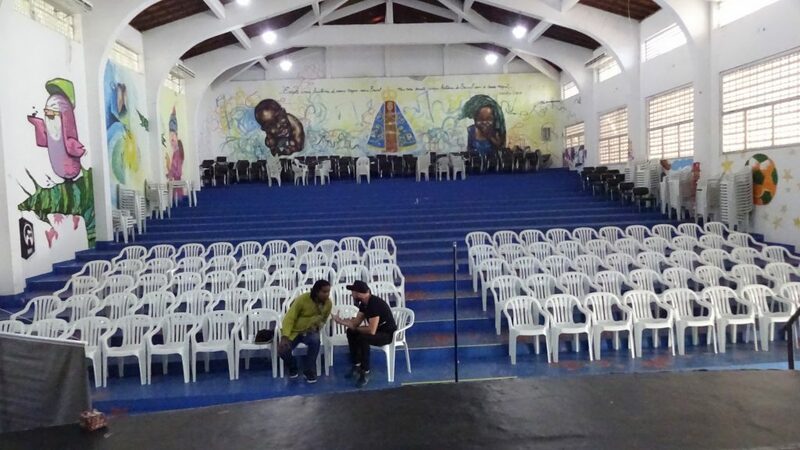 In another detention center we visited, the area where we performed was a cool theater that was air-conditioned and they had nice seat for all the kids to sit in. After the first few acts we did, the kids were all with us and into everything, which gave us a lot of hope. So many of them were in bandages and had scars from bullets, knives and accidents they had been in. I perform Irish step dance and before I start I show an Xray of my leg which I broke a few years ago. I have a rod and 8 screws in my leg and spent time in a wheel chair. I share how we each have an “X-ray”, we each have scars, some on our body, some on our mind or heart. I then share how Jesus also had an “X-ray”. He had scars. He suffered and bore our pain. He knows what we are going through and can heal us. 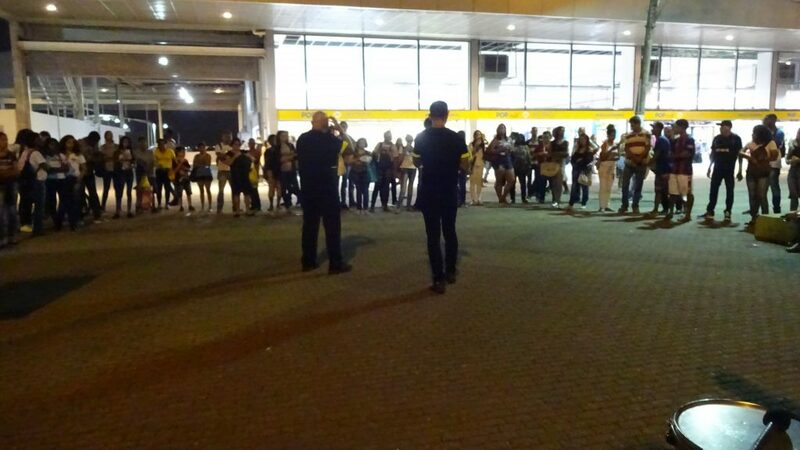 All the guys starting clapping to the beat while I danced and many were in tears while I talking with them. It was a beautiful moment. As the guys left, they all wanted a hug which was so cool coming from these “bad” hard kids. I have a rabbit that I use in a magic trick (which draws gasps of surprise:), and at the end all these tough guys wanted to hold or touch the bunny. Inside we are all children. After the performance the directer said, “Shh, you hear that silence? Your message is now setting in”. It meant a lot to us because usually the facility is full of shouting and screaming and to think that now, so many young people we’re thinking, is the whole reason we do what we do. Performing at a large park near where we stay. Besides all of the many events tea re scheduled, we also constantly go down town to the city centers and parks. Because this city is so huge, there are at least 10 areas where it is just packed for lunch and dinner. We are able to reach people from all walks of life and all the surrounding areas. There is a ferry that crosses the channel that everyone uses every day to get to and from work. 2000 people get off and on every 20 minutes. So if we are in that plaza for a few hours, we reach a lot of people. 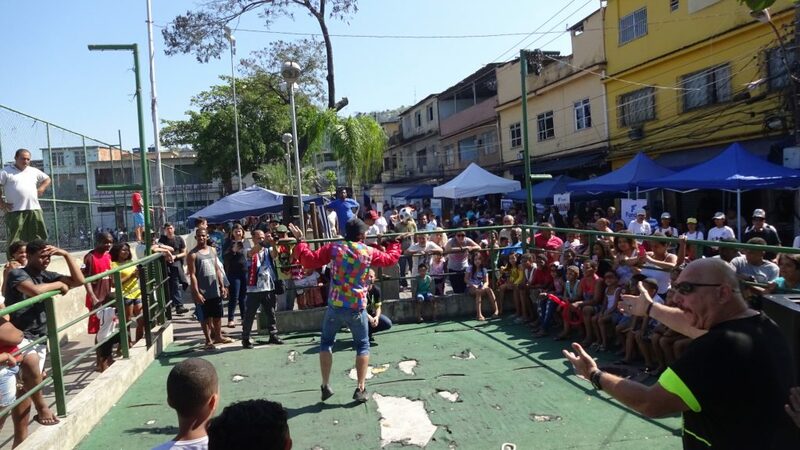 There are also large markets, metro stops at the bottom of favelas, beaches that are packed and train stations where we spend time reaching people. We use music, dance, magic, theater and large banners with inspiring messages to touch as many as we can with the Fathers love and the hope of the Gospel. Down town center near the port. Through each act we weave different messages about love, family values, forgetting our past, using our time and drawing near to the Lord Jesus. We give out color flyers, posters, Gospels of John as well as little stuffed animals, candy and chess boards for prizes and for the children. After a dance we do that conveys a caterpillar, turing into a butterfly we let little girls from the crowd come dance and wear little butterfly wings that we have for them. We talk about how we are all a child inside, a butterfly waiting to be released. One day that we performed at the park, it was my parents 39th wedding anniversary and thus a very special day for my family. Of course they wanted to spend it giving to others, just like they have done all their lives. We shared a special moment when my dad and mom shared with the crowd about raising a family and both sang a song together. 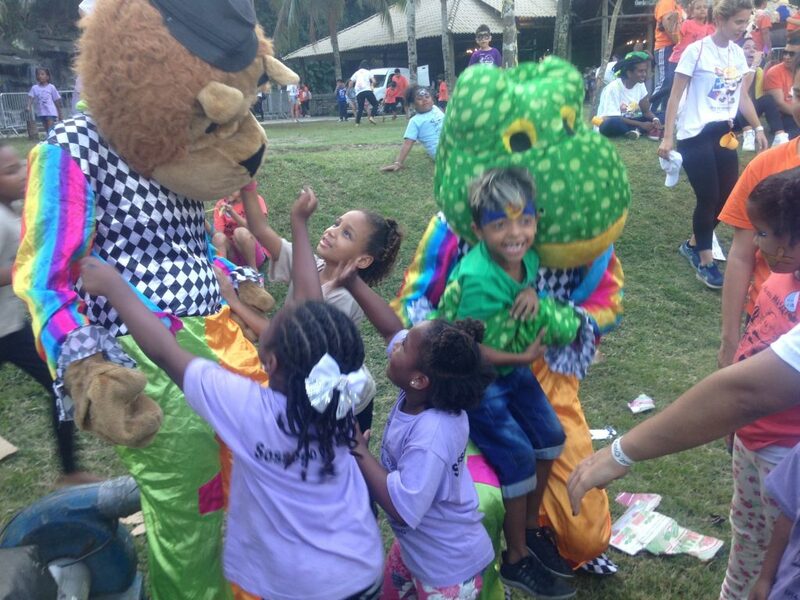 Working with kids at special events. My brother dressed as a prince on stilts (it freaks me out when he picks up kids). We got the chance to participate in a special event called, “Day of Dreams”. 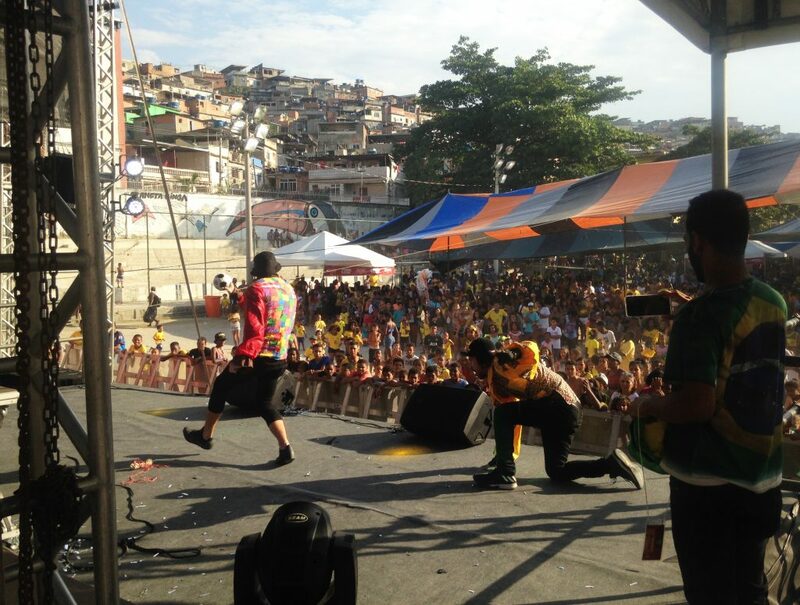 A catholic foundation organized a huge festival for 1,500 poor children from different favelas throughout the state. 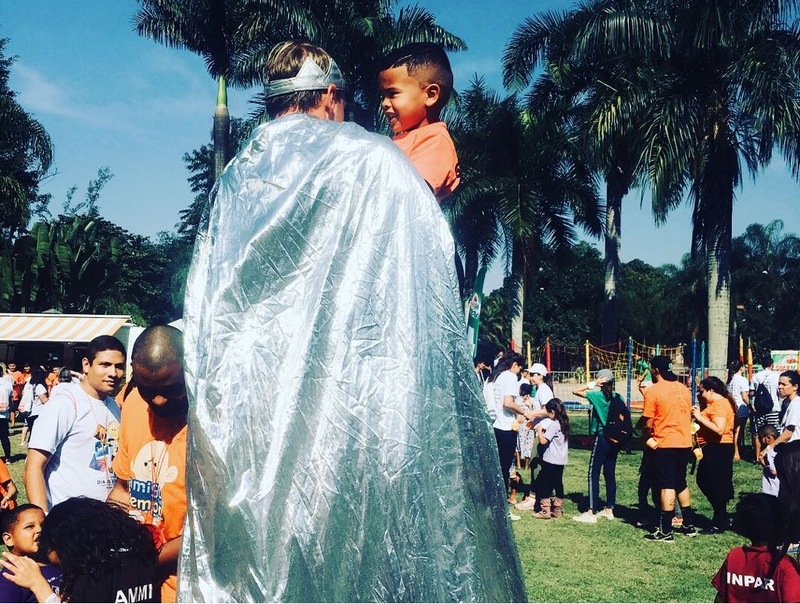 They chose 1,500 volunteers, one for each child, and paired them up so each child got special attention and care. 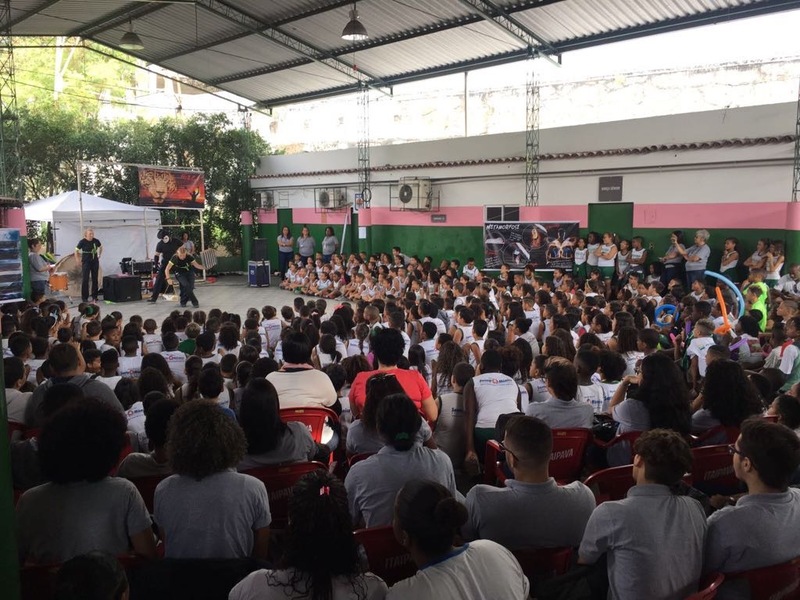 They asked us to do two performances, one for the volunteers before the children arrived, and another one for all 3,000 people at the close of the event. It was an awesome day! I’m in the frog costume and my sister is in the lion:). 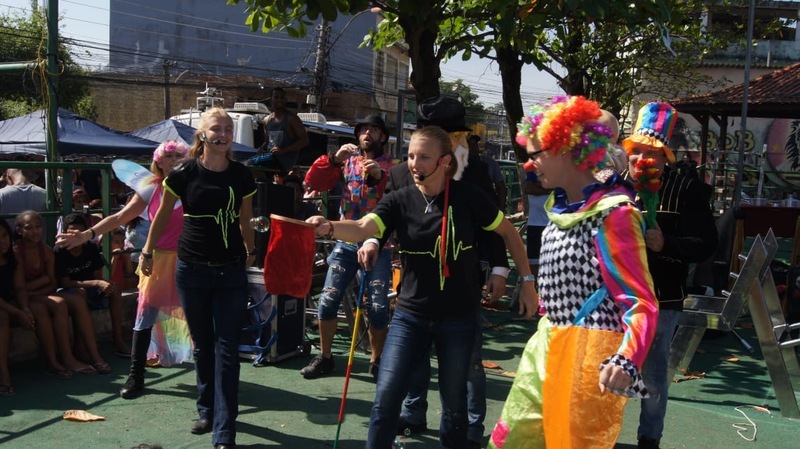 At the first performance here, we did things to pep up and inspire the volunteers to really love the kids and leave it all out there. As we were setting up, we noticed some of the volunteers were consumed with their cell phones and taking selfies. We did a little funny act to address this and encourage them that today was about loving someone else. We do a magic/dance routine where we “throw” a little red scarf to each other (by making it disappear and reappear) to a cool hip hop song. We use the red scarf to say that each of us have the mage to love in our fingers and we can give it to others. Hard to write out but it was really cool and met with a loud round of applause. Our second performance was for all the kids as well as everyone present and it went really well. We brought a number of the kids up on stage to participate in dance and magic and it meant the world to them. We had just worn black t shirts as uniforms because they are easy to keep clean but we wanted to add little color. So I got some neon ribbon for .99 cents a roll and designed this heart beat / frequency on our t-shirts. My mom borrowed a sewing machine and stitched them on:) It’s cool when we all stand in a line it looks like one heart beat. It is our mission to bring people back from “flat lining” and give them hope to come alive. 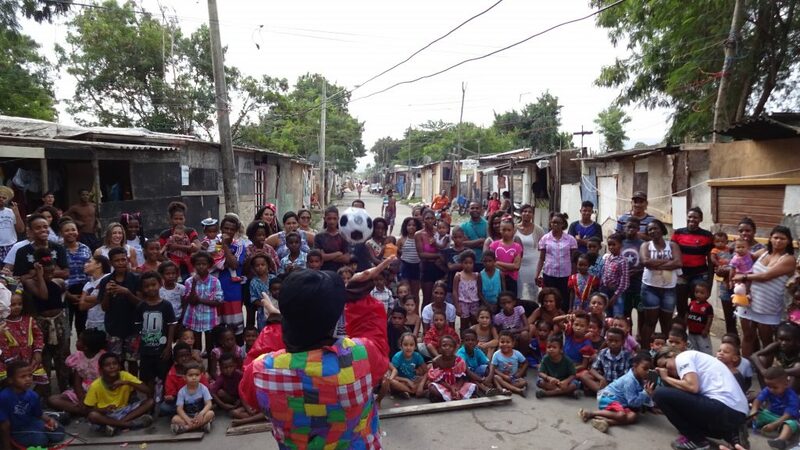 Another event we did was in a park at the foot of a real bad slum. The lady who organized it invited different small foundations and schools for disabled, special needs and elderly people. 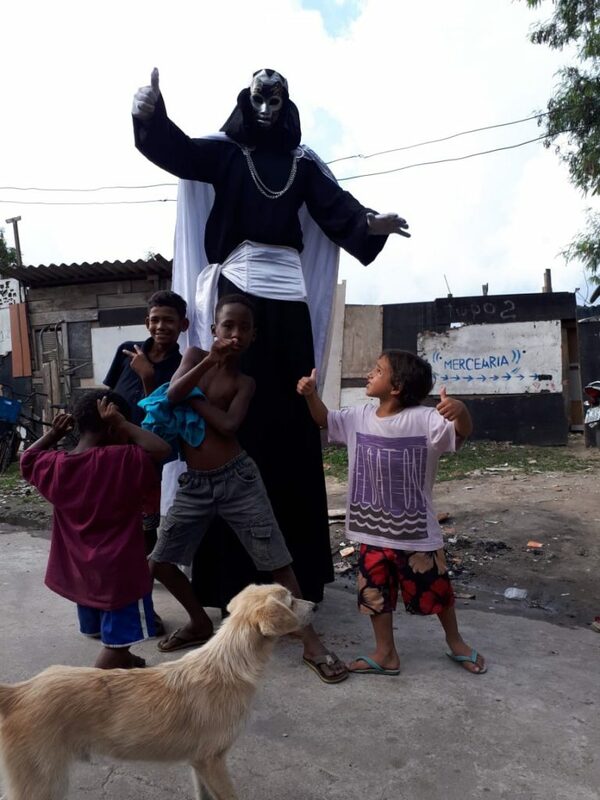 There were a lot of kids so we did all of our magic routines, played a cool game with a giant ball and used our costumes and puppets. In one of the magic routines, I start by playing with a jump rope by myself, my brother is playing the song “Fragile” by Sting on his guitar. I then stop jumping rope and say that I am so sad, I feel like I can’t be a child, my life is hard, no one cares and lines like this to identify with their suffering and pain. I then cut the jump rope in half a throw it aside, as if giving up on being a child. Then my father comes out, makes me laugh and helps me realize that he loves me and I can always be a child. He is conveying our heavenly Father and that no matter what we go through, there is hope. We have a beautiful poster of Jesus laughing that a prisoner once drew for us that we put up behind us during this act. 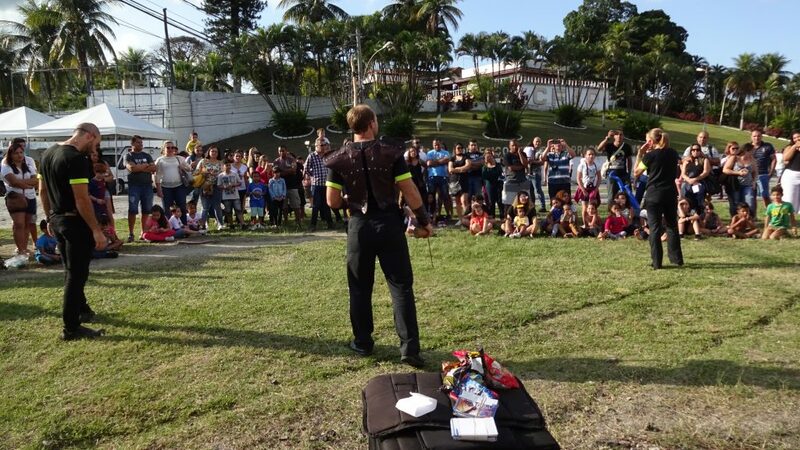 Later, in the magic routine I magically put the cut jump rope back together and continue to play as a child (long skit short:) there are clowns and other tricks through the act and we perform it to the Cirque song, “Algeria”) The act really touches people and I have seen people in tears. After our performance, many people came up to thank us and talk. For my birthday my sister gave me a rabbit. Its a special breed that is super furry and super cute:) I made a magic trick out of a box, some felt, elastic and a drum stick that I use to make the bunny appear (I made the trick for about 10$ compared to a few hundred it would have cost if I bought it). I have a volunteer blow up a balloon, draw a rabbit on it then put the ballon in the box. They then pop the balloon and Abracadabra, there is a live rabbit:)!! Literally every time I do it there is stunned silence then cheers and gasps. It is so fun to do. I let this old lady in a wheel chair hold my bunny and she just broke down crying as she stroked its fur so softly. A little boy with down syndrome was so excited to hold Gracie( the bunny:)) as well. 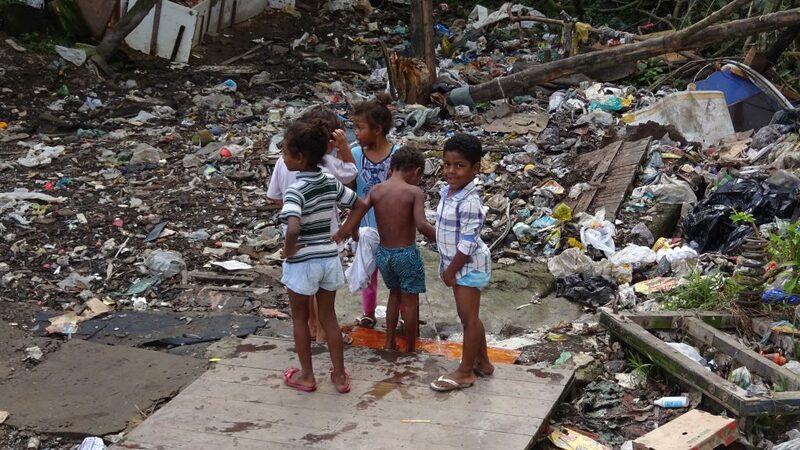 We got the chance to visit one of the worst, most dangerous villages in Brazil. Normally it is too dangerous to go in or out but we got the opportunity to work with a group who had permission from the gang to put on a party there. It was an incredible experience. There were massive piles of trash on the roads leading to it which they deliberately put there to keep the police out, so we couldn’t drive in but had to walk and carry all our equipment and props in to the Favela. 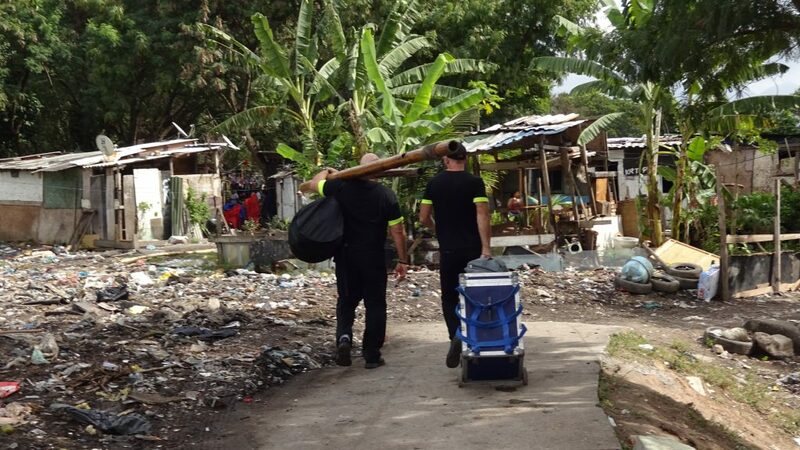 Walking into the slum with our performance equipment. As we were unloading our van, a military truck approached, full of army soldiers with machine guns. I was talking to these two little boys and when they saw the army pull up, they started running, crying and asking me to keep them safe. It broke my heart to touch their reality that when they see police, they know violence and war can break out since the police invade to combat the gangs and drug trafficking. There were gang members with machine guns standing by and it was tense until the army trucks passed by. A guy told me that every few days there are bullets flying. We shared a special time with these people and brought them laughter and a special show in the middle of their suffering. There is no other hope but that of eternal life and the love of Christ Jesus. 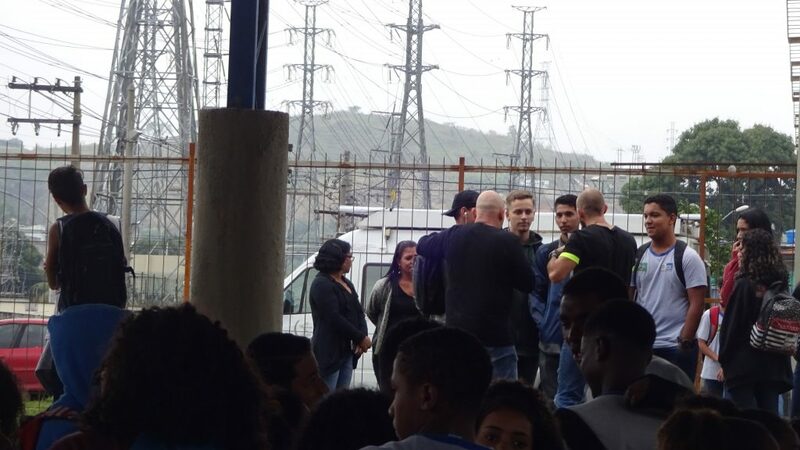 Another event we did was in a community center at the bottom of a huge, very dangerous favela. The organizer invited multiply schools, foundations and communities to one area for us. Around 700 people showed up and it was very loud:) The kids and families came from very poor backgrounds and were so grateful to get a special, high quality show for free. They loved the magic and too many were quick to volunteer. (“Can I get a volunteer”….200 kids stand up;)) When I made my bunny appear, literally the whole crowd screamed:) It was cool. My brother on the stilts he made. Many of the kids knew Capoeira and were excited to see our fire/Capoeira act. Through it we teach how we have to be courageous and be an individual even when surrounded by things that could influence us in a negative way (drugs, gangs, violence). It was a long day but very rewarding. 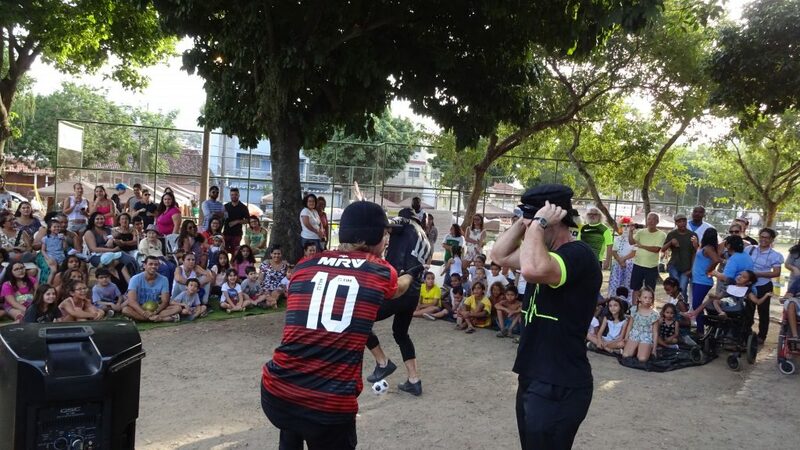 Afterwards we got tuns of emails and requests to visit schools, favelas and community centers. At a large community event. The echo was insane! 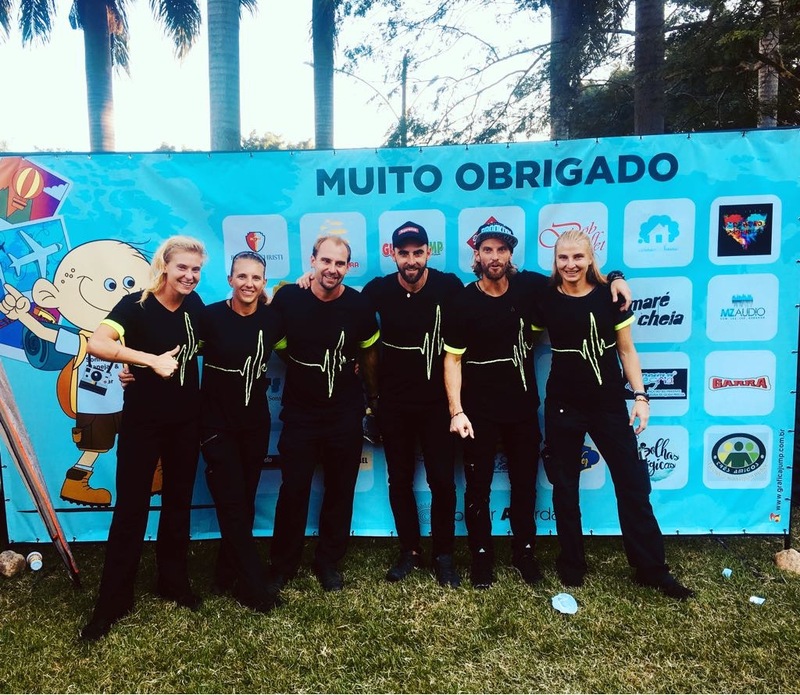 We were also invited to work with the Brazilian military police, performing events for their children, on police bases, in military prisons and at a very large festival. It was an honor to work with them and put on a party for their children. The police here have a very hard job dealing with all the violence and chaos of the city and we were able to pick them up and bring some encouragement and the guides that comes from the Gospel. This one event we did with the police started out as…how do you say…COMPLETE CHAOS! 🙂 Tuns of people, burning hot sun, no space to set up, dogs, ecs. But we found an area where we could do a small scale show and it ended up working out:)! These people were very poor and it meant the world to them that we would be there. The event was organized by a cop in the military police who was very grateful we came (and didn’t bale when everything was going south:)). So many beautiful people came up at the end to talk and to tell us their stories. We have a lot of Gospels of John and New Testaments that we give out and people are so grateful. Many of them don’t have and cant afford to get a bible. 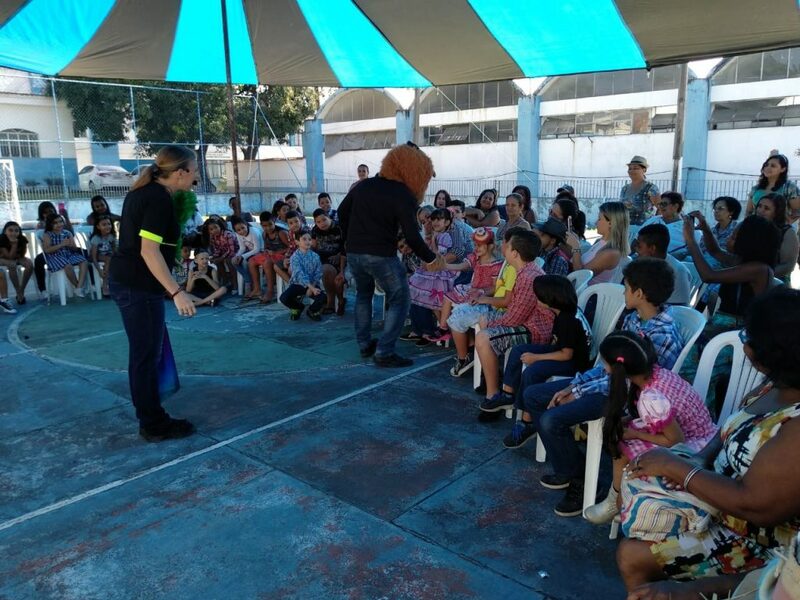 Performing a special party for children of the military police. We visited a military police prison. We were not allowed to take any pictures here and the security was tight. There were about 200 men in the prison and we reached them all at the same time. They all looked liked cops out of a tv show, cool, tough and together. They were a bit wary of us when we started and had no idea what to expect, but after we got started they realize we sincerely wanted to help them and encourage them and they completely opened to us and let us in. They are all still currently cops, but had committed a crime and now are awaiting trial or for their case to be dismissed. The situation here between the police and the gangs is very complicated. Sometimes the cops are caught in a gun fire and may shoot, “civilians” who actually had a gun which they cannot later prove. Often cops take the fall for higher up government corruption, and sometimes they do take bribes for need of money or fear of gang retaliation. The situation is very complicated and all though some of these men have made bad choices, some are victims of bad circumstance. They were extremely grateful for our visit and for picking up their spirits. My father spent time to teach them some things from the Scriptures about how we have been completely forgiven once for all. My mother sang a beautiful moving song called, “Crying for Your love”, that is about how the Father longs to show them His love. Many were in tears and really moved by it. At the end so many came up to tell us their stories and talk one on one. One guy just said for the first time someone showed him compassion from all he had been through instead of condemnation. He asked if there was any chance we had a soccer ball he could possibly have. I actually had one in the car I was able to go get and bring to him. It meant the world and he was so happy. One event we did with the police ended up being for over 7,000 people on a huge stage. It was an unbelievable opportunity to reach so many. 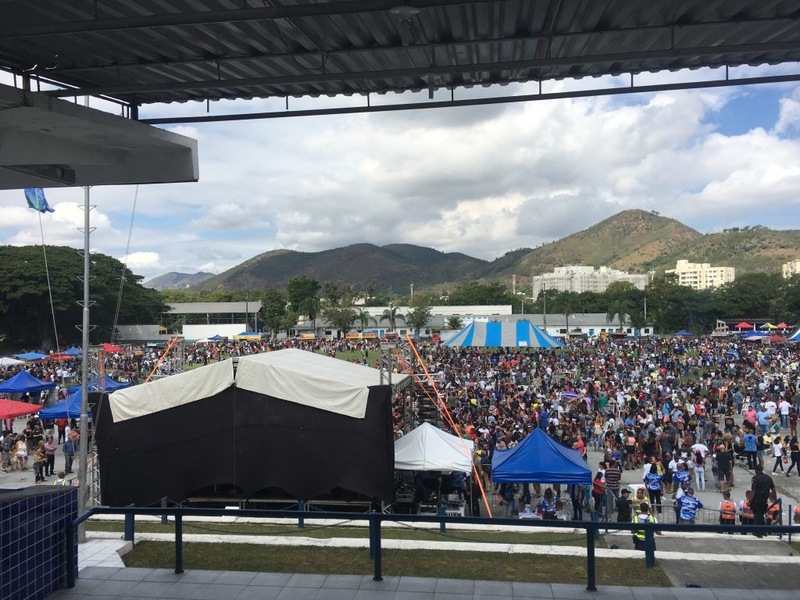 Police event for over 7,000 people. One morning we were scheduled to perform at a large school. It was pouring early and we had to leave at 6am to get to this school by 9. We were afraid the roads would flood out and we considered canceling, but after texting the school workers we decided to go and they told us they had a covered area where we could perform. This school was so far in the middle of nowhere, when we pulled up I thought it was abandoned and we were at the wrong address, but it was right and all the kids were waiting for us. The streets around it were just covered in trash, pigs and cows walking around and teens with machine guns hiding behind a wall. When we walked into the school, instantly all the kids were so excited to see us and surprised to see Americans way out here. The teachers and director really thanked us for coming. We all crowded into a covered gym out of the pouring rain. It is always a bit more challenging to break through when the audience is all at the teen age category because peer pressure can be so strong, but God always gives us His wisdom and different ways to touch them. Sometimes we have to call out kids and lovingly teach them what it is to be an individual, to respect others, to not talk while others are talking, to be a leader and make a difference for the good. No matter how grown up some of the kids wanted to act, they sure loved the magic and were blown away by our routines:)! A cool 16 year old kid helped me do my appearing bunny trick. I told him how the trick was down before hand so he could do it. When the whole crowd screamed their delight, he was really happy. At the end, they all asked for a Bible or Gospel of John and waited to get a chance to talk to us one on one and tell us their stories. One girl named Gabriela told me that her grandmother, who had raised her, just died and she was trying to keep it together. She had suffered abuse as a child and her grandmother was all she had. She was in tears and wanted to be held. She was so grateful for the message we brought. Many the teachers were also in tears and told us they had been at the point of just giving up. They said they could see love in us. Afterward a lot of the kids wrote us and we stay in touch with them now. My brother performing a rap he wrote at a school. One day we visited a prison/hospital for people with mental disabilities who had committed crimes. The director was a kind, tender man who treated the patience as his children not as criminals. Most of the men had the mentality of children and were very simple so we kept everything we did simple and clear. 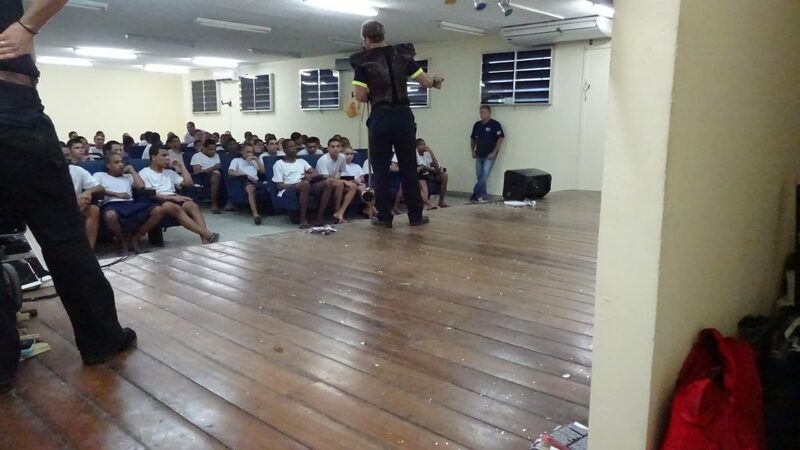 It was visiting day today so some of the prisoners families were able to watch the show as well and we were able to help bring healing to them. We did many things to help them and make them laugh. 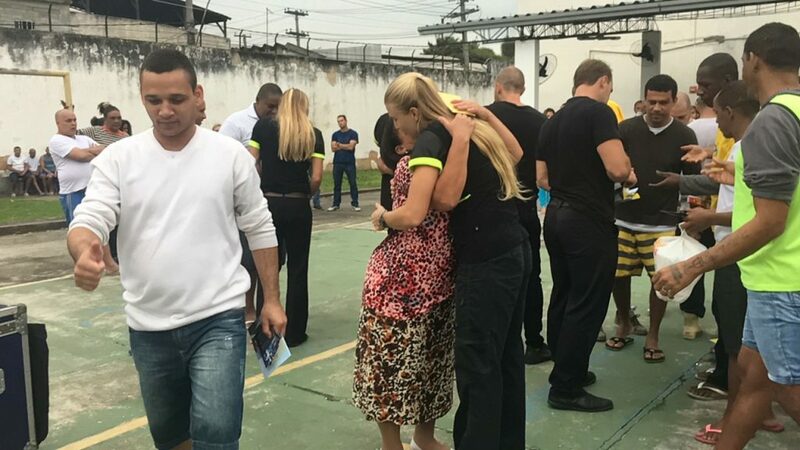 At the end, one man took the microphone and thanked us, then all the prisoners said the “Our Father” together, it was really beautiful. Talking one on one with the families after our performance at the prison/hospital. One story was so sad. There was a father who was visiting his son. The father had beaten the son as a child and thus caused his mental disability! The son had forgiven the father but the father could not forgive himself. The both held each other and cried then prayed together. The father kept saying he was sorry and the son kept saying it was ok. It was one of the saddest stories I had witnessed. Oh, the tragedy of our fallen human state. We are so broken and so fragile. I know this blog gets long and most people probably won’t get all the way through it (unless maybe there is a zombie attack and you have to hide in your basement for a long time kkk:)). I just like to record these things because I have been an eye witness to the power and love of God and how He will use and bless someone who serves Him. It is my hope that maybe someone would read this blog and be inspired to turn off the main “road” and start driving down the Highway called Love. Because on this road, the view is beautiful and you will never go back to your old “road”. The world is full of suffering and the need is so great. You can be the answer to someone else’s prayer. You could be the sign from God they were praying for. You can change a life. Never settle dear friend. Dream big. Be Big. Because God is big and there is a big world out there that needs what you can give. Even those who believe just a little, can do very big things. By for now, take heart, love you guys.